I had bought a bag of smaller sweet potatoes with intentions to bake them for a quick snack. I’ve found when the sweet potato is smaller it doesn’t seem to last as long vs. the large fat sweet potatoes. So needless to say, I had a bag of potatoes that were beginning to wrinkle and some get soft (I did throw 2 out like that). I also had one butternut squash left from my prize purchasing back in September. I was at a road block because I knew I had to use or lose these veggies and because I know my boys are not big fans of these orange colored veggies. I happened to go to a restaurant in town and that’s when inspiration hit! As a starter, a sampling of a soup was served. It was butternut squash sweet potato! I couldn’t believe it….just an hour before I grouped together the exact same veggies I was now sampling at a restaurant. Talk about a coincidence and the soup/bisque was outstanding! Of course I felt the need to try to duplicate this at home. I also thought with it being a soup/bisque that the veggies would be disguised being pureed, so it would be more appealing to my boys. 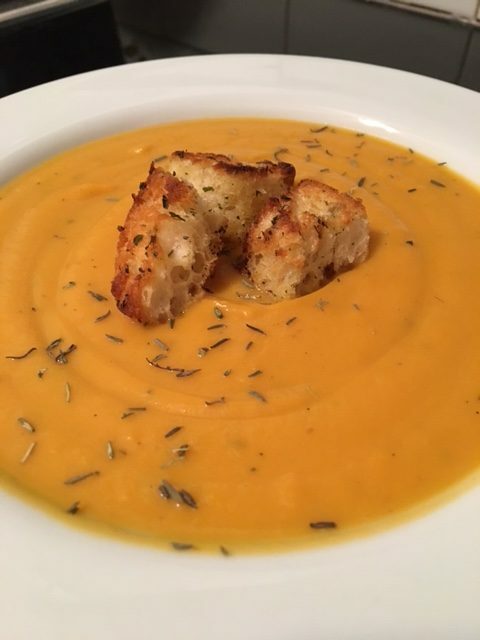 After a few minutes of swirling thoughts on how to prepare and make this bisque, based on my years of cooking and making similar soups/bisque’s, I decided to bake half the vegetables and roast the other half. I was looking for depth while keeping it simple. Roasting vegetables brings a depth in taste…. a little caramelized sweetness. I didn’t want to over power the recipe with one taste though. The combination of sweet potato and butternut squash lends a sweet note already so that’s why I opted to roast half the vegetables as a way to break up the sweetness and add depth. Roasting the garlic vs. sauteing also adds another layer in flavor and a warm slightly sweet taste. I can eat these tender sweet cloves right out of the oven! Truly, it’s a perfect compliment to the subtle and sweet undertones to the orange vegetables. The consistency is thick…. its a puree. It kind of reminds me of applesauce! But as I’ve stated in other recipes, there is no right or wrong way when cooking. Find “your way” by adding more vegetable broth to make it a little thinner. Maybe your not a fan of thyme and want to add another spice….have at it! Maybe your vegan and opt to use an almond milk or whatever your preference of milk is. Maybe you add more “milk” (your version of milk) to make it more creamy or less fat by using a low fat milk. If you don’t want to roast any of the vegetables and only bake them, that is perfectly fine as well! Suggestions are meant to help and guide. If you land a combination and want to share that would be fantastic! All of the butternut squash, sweet potatoes and garlic will bake/roast at the same time in the oven at 400° for 30-45 minutes or so. Once tender all vegetables will be added to the same bowl or blender. I had roughly 4 cups of mashed vegetables. Cut the butternut squash in half. Scoop out the seeds with a spoon (grapefruit spoon if you have one). Place one of the halves in a roasting pan cut side up. Fill the pan with about an inch of water and cover with foil. Bake at 400° until tender, about 30-45 minutes. At the same time take the other half of butternut squash and peel it. Cut in uniform cubes. Place the cut squash on a baking sheet sprayed with cooking spray. Drizzle with olive oil, salt and pepper to taste. Place sheet in oven the same time your baking the other half of squash. Toss at least once while roasting. Once tender and slightly browned add to a bowl or blender. 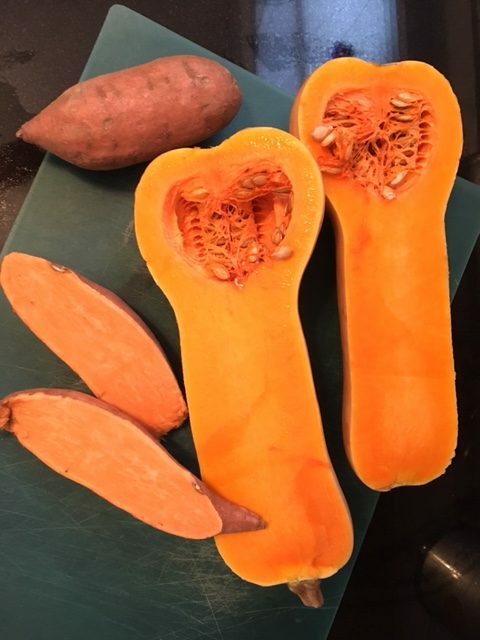 Use a fork or knife to poke a hole in 2-3 of the whole sweet potatoes. Place them in the oven at the same time your squash is baking. Once tender and cool enough to handle scrape the flesh out and into a bowl or blender. 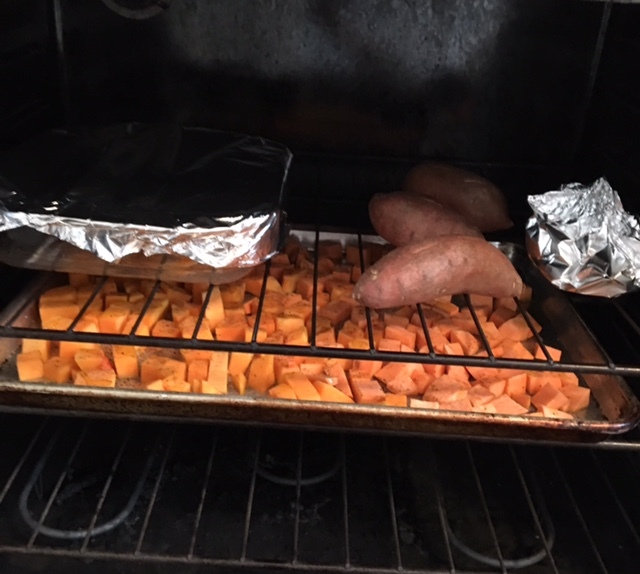 Peel and cube the remainder of sweet potatoes and place on the same baking sheet with the butternut squash. Drizzle with olive oil, salt and pepper to taste. Toss at least once while roasting. 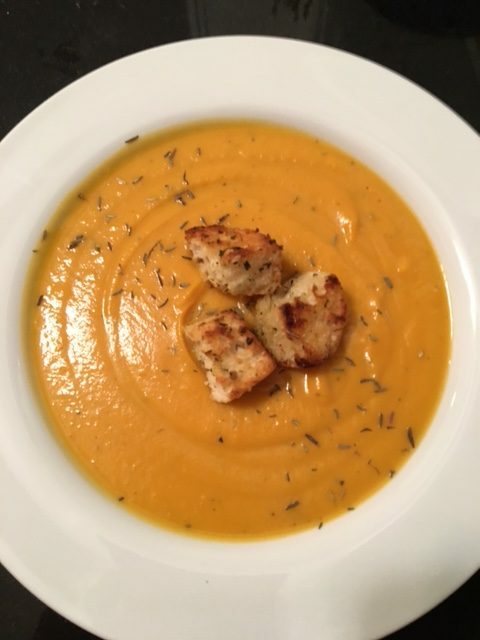 Once tender, add cubes into the same bowl with baked squash and sweet potato. Take a whole head of garlic and slice off the top. The idea is to expose the tips of the garlic but leave them intact. 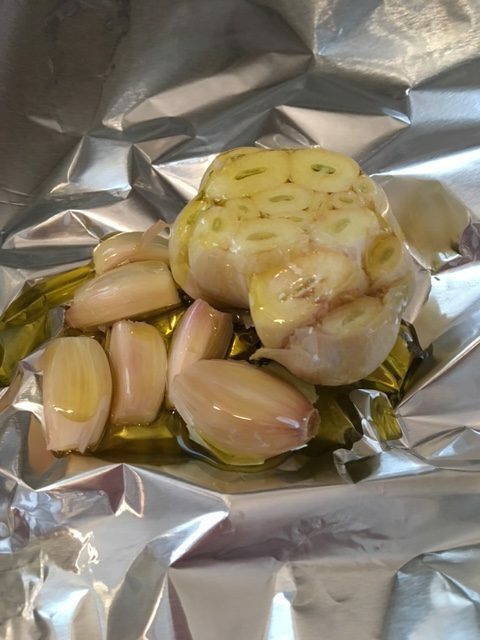 Place cut garlic on a piece of foil large enough to come together like a scrunched up package. Drizzle with olive and fold up the foil in an upright package. Place in oven with squash and sweet potatoes. It should bake for the same time as the other vegetables. Once the garlic is at a temperature your fingers can handle, squeeze the soft garlic out of its shell onto the foil. There should be some olive oil still left on the foil from baking. Take the soft garlic with olive oil drippings and add to the bowl or blender with the baked/roasted squash and sweet potatoes. All your vegetables should mash up to 4 cups if using smaller vegetables. Use a blender or Cuisinart quick prep wand to puree while adding 4 cups of vegetable broth slowly. If using a blender, I recommend adding some broth before you add the mashed vegetables. Your blender will be filled to the top. Once pureed, pour mixture into a soup pot. Add thyme, salt and pepper to taste. Cook on low/simmer to heat and let the flavors melt together, about 20 minutes or so. Add 1 c. of half n half and continue to heat to your desired temperature. Place desired amount in each bowl and top with croutons (optional). A sprinkle of thyme adds a nice touch too. This time I used Ciabatta bread rolls, sliced and cut into chunks. Melt some butter in a frying pan, add the bread chunks and coat in melted butter. Sprinkle with salt and pepper. Saute until slightly brown and crisp. They will continue to crisp as they cool.